It is easy to forget that Lee Green was once a village green – large enough for cricket matches – with a windmill and a village pub. Unsurprisingly, there were farms too – over time, the blog will probably cover most of the former farms in the area. The starting point though will be a farm next to the green – the imaginatively named Lee Green Farm. The location of the farmhouse was roughly where the decaying remains of the Leegate Centre are now located. Its age is uncertain, oddly it wasn’t covered in Josephine Birchenough’s fascinating booklet ‘Some Lee Farms and Fields’. 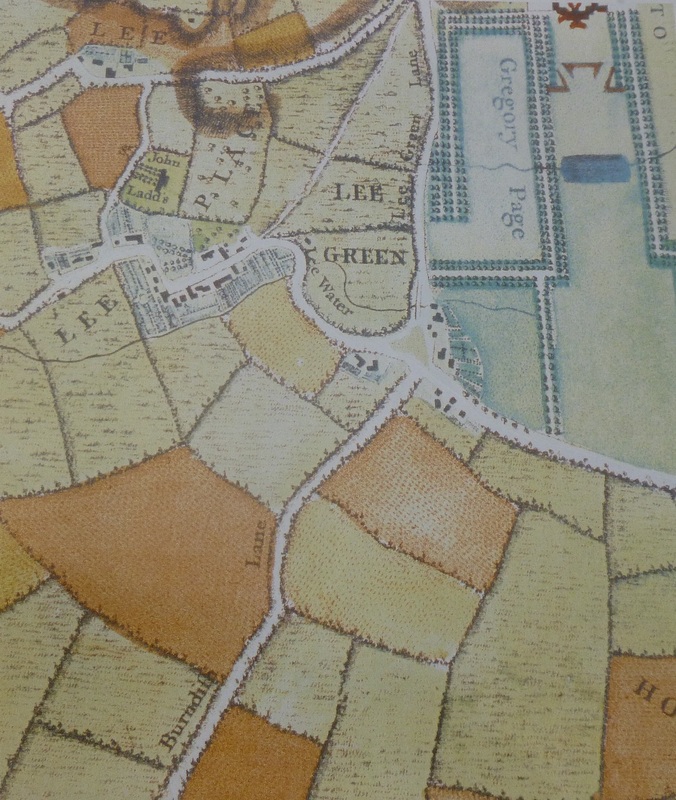 However, the information board at Lee Green suggest dates it around the mid to late 17th century, there were certainly buildings there in John Roque’s 1740s map (1). The land was owned by the Crown, probably as part of the extensive lands held through Eltham Palace, and the first on-line reference to the farm was a lease granted to William Morris in 1838 of both Lee Green Farm and the neighbouring Horn Park Farm. Lee Green Farm (see picture below (2)) was 131 acres in size, according to tithe records, and was a mixture of arable and pasture but it was just a small part of the land that William Morris (sometimes spelled Morriss) farmed. As early as 1815 he was leasing much of the current Cator Estate (3) and his 9th (ninth) child was born in Kidbrooke. The land was largely rich pasture that he used for dairy cattle – important in terms of proximity to London, prior to the development of the railways. By the 1830s he had relinquished much of this Cator estate interest, Kidbrooke tithe records for 1850 had his interest at just 7 acres. Some of this was to allow development – such as a field where 97-115 Lee Road now stands (4). The 1838 lease of Lee Green Farm was presumably a continuation of a previous one, certainly he was farming in Lee in 1820 as there was a case as the Old Bailey involving the theft of two cows and an attempt to sell them to a farmer in Mile End – William Smith was found guilty and hanged. The timings of his move to Lee are confirmed with the birth of his 11th child there the same year. William Morris(or Morriss, the spelling of the surname varies) was from Banstead, Surrey was the son of Samuel and Sophia Morriss, and was baptised on May 29 1780. By 1804 he had married Elizabeth Walker and they had their first child Sophia and they were living on Blackheath Hill – presumably close to the Green Man Hotel. At that stage he was described as a ‘milkman’ or ‘cowkeeper’ – possibly having a small amount of land (as was the case with Clark’s of Summerfield Street). Elizabeth died in 1829 and was buried in the old St Margaret Lee Churchyard (see middle vault above). William Morris remarried in early 1832, Susannah gave birth to the first of six children for the new family at Horn Park and seem to have made that their home rather than Lee Green – their youngest child was baptised in Eltham, rather than St Margaret’s Lee. The farm buildings moved slightly to the east in the 1840s to what was to become known as Tudor House (roughly where the Leybridge Court estate is now). This was presumably under the stewardship of Morris, who also built a few speculative homes adjacent to it (6). One of the frustrating elements of writing this and other posts about the history of the area is that written history tends to focus on the rich and influential in society. Nothing is known about the farm labourers on Morris’ land, other than there were a number of tied cottages, whether Morris was a good employer, his rates of pay and so on. The only references to the rural working classes in Lee tend to relate to crime, and as we have seen with the case of the theft of cattle in 1820 and its draconian punishment, and when there were calls on poor law relief – such as in the bitterly cold winter of 1814 – referred to in the post on Benjamin Aislabie. There were some attempts to redress this by William Cobbett in the 1820s. Cobbett was a late Georgian and early Victorian radical, the son of an agricultural labourer from Surrey, he opposed to the Corn Laws who undertook a series of ‘Rural Rides’ to look at the condition of farming in the 1820s. In addition to the Corn Laws, his ‘rides’ were against a backdrop of the Enclosure Acts of the early part of the century, where the rich landowners took ownership of what hitherto had been common land. 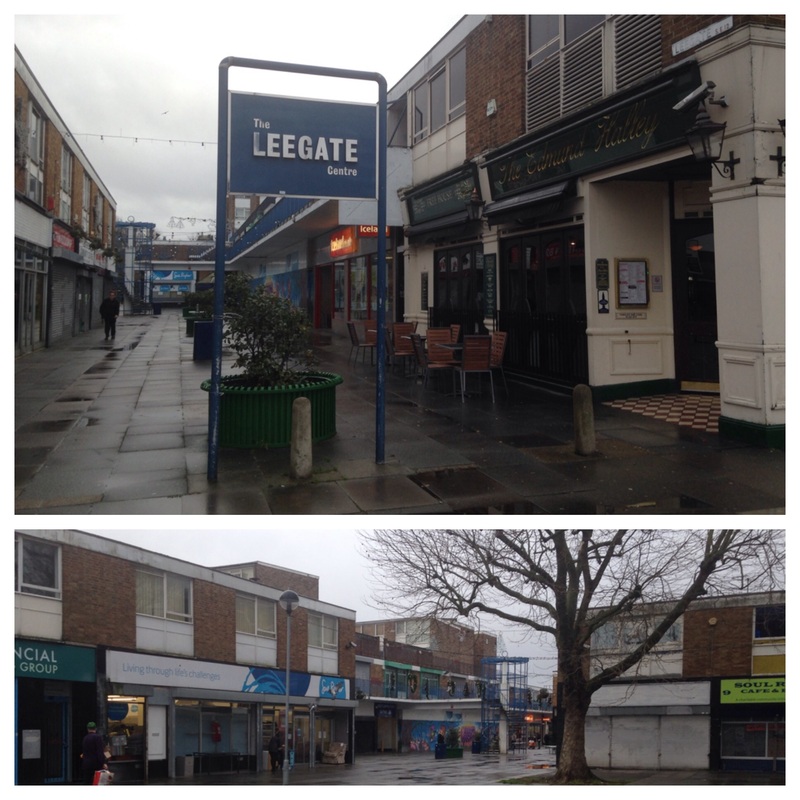 While there seems to have been little common land in Lee, the Acts had a major impact elsewhere in Lewisham – particularly in Sydenham. The labourers seem miserably poor. Their dwellings are little better than pig-beds, and their looks indicate that their food is not nearly equal to that of a pig. Their wretched hovels are stuck upon little bits of ground on the road side, where the space has been wider than the road demanded. We will return to William Morris in his final days at College Farm where he was to pass away in 1851, by then Lee Green Farm was being run by his son Richard, three of his sisters Eleanor, Rebecca and Mary were living there too – the farm was listed as 302 acres and employed 20. Richard was still at the farm in 1861 although the acreage was much reduced, just 114 acres were being farmed. He moved to Days Lane Farm in Blackfen around 1868 (see comment below), he clearly had some interest in land in Lee after he left as he was on Electoral REgisters into the 1870s. Beyond 1861 there seem to be no mentions of the farm, through on-line sources at least, – maybe it became unviable as land was lost to development. The original site of the farm was redeveloped in the 1860s as housing called Carston Mews, although the name lived on it Carston Close, just to the south. Carston Mews itself was demolished to make way for Leegate shopping centre in the 1960s. The centre has been in decline since Sainsbury’s opened to the west of Burnt Ash Road, something compounded by an increasing amount of empty office space above the centre. There are plans to redevelop the centre going through the planning process at the time of writing (January 2016). I am indebted to Mike for providing most of the family information via a fascinating comment (see below, you may need to click on the title first if you can see another post below this one) – the post was substantially updated in June 2016 as a result of this. This entry was posted in Lewisham History and tagged Carston Mews, Lee Green, Lee Green Farm, Leegate Centre, William Cobbett, William Morris - farmer on January 13, 2016 by Paul B.
I have been fascinated to read your research on William Morriss of Lee Green Farm and Horn Park Farm. You have stated you have little information on William Morriss himself. I will try to help. William Morriss was my great great grandfather and he was born in Banstead, Surrey and baptised on May 29 1780, the son of Samuel and Sophia Morriss. William Morriss married twice, firstly to Elizabeth Walker, although I have been unable to trace the marriage. They had at least 13 children. The eldest daughter, Sophia Morriss was born in Blackheath Hill in 1804 and died in 1838 at the home of her uncle, Alexander Rowland of Macassar Oil fame at Rosenthal, Rushey Green, Lewisham. In the early days, William Morriss was described as a milkman or cowkeeper. By 1816 the ninth child, Richard was born in Kidbrooke and then by about 1820 the eleventh child was born in Lee. Elizabeth Walker Morriss died on July 11 1829 and was buried in the family grave (No. 36) at St Margarets, Lee. William Morriss married secondly, Susannah Winifride Horne on February 11 1832. The eldest son, Edward Morriss, my great grandfather was born on November 16 1832 at Horn Park, Eltham, while the youngest of six children, Henry was baptised in Eltham in 1844. William Morriss died on April 10 1851 at College Farm, Burnt Ash Lane. The 1851 census records the family living at College Farm, a small farm of 80 acres employing 3 labourers. William Morriss’s wife continued to live at College Farm until the death of her mother, Catherine Horne in 1855. On June 22 of that year the surrender of the lease of College Farm from S. Morriss to William Brown was sealed. Representatives of the Morriss family continued a link with Lee. My grandmother was born in 1876 at Melrose House, 77 Eltham Road, while daughters from William Morriss’s first marriage were living in Radway Cottage, 7 Eltham Road (next to the fire station today) at the time of the 1861, 1871, 1881, and 1891 census. John Chambers originally lived in Radway Cottage until his death in 1862 and named the property from where he came from, Radway, Warwickshire. I hope some of this is of interest. That’s fantastic Mike! As you have seen I really struggled to find much out about William Morriss or his family, the spelling of the name was uncertain and I couldn’t even find where he had come from. This starts to put the history of the farm into some context. Short term I will put a note in the text to have a look at your comment but I will add much of it into the main text. I really appreciate input like this – it is one of the lovely things about writing the blog is that posts can get added to, improved and changed where I get things wrong in a way that you can’t do with anything printed. Thank you for visiting and your input.